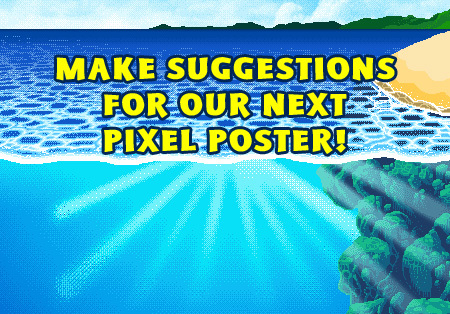 Make Suggestions For Our Upcoming Underwater Pixel Poster! Over the years, many people have suggested we create an underwater themed pixel poster, so I'm happy to announce that we're finally making it happen! Having released our "8-bit Worlds Collide" and "Pixels in Space" pixel posters, Pox and I decided it was time to take our pixels into the deep blue sea. As always, we wanna give all of you a chance to help create it. It's a blast to see what aquatic ideas all of you come up with each time we do one of these, and we're sure you'll have some fantastic suggestions for this next poster. I'm really excited about this next print, as Pox and I have already added some of our favorite ideas into it that we think you'll all really appreciate. 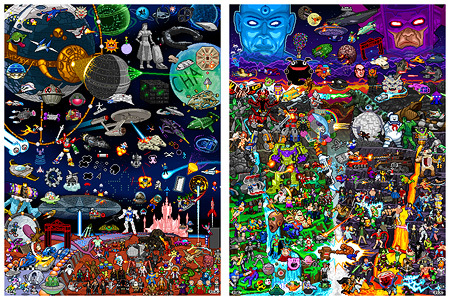 Also, for those of you who haven't had a chance to pick up our "8-bit Worlds Collide" and "Pixels in Space" prints, they're still available here. 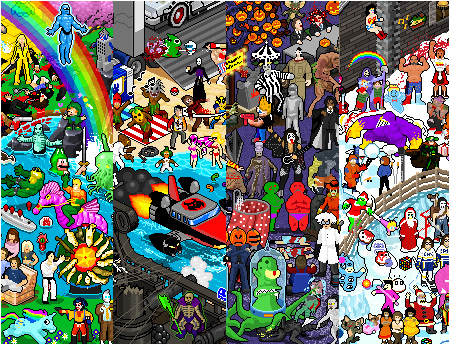 So many pixels, all colorfully arranged on two posters to make your eyes happy forever. Alright, start posting your suggestions here in this thread and maybe your ideas will end up on our next big pixel print! I hope you enjoy my ideas Rog! I'd like to hear back from you so let me know what you think, I try not to suggest too much so others can get what they want on the poster as well, but I'm sure you can make all our suggestions work! Vaporeon! Ecco the Dophin! Sailor Neptune! The SS Minnow! Leisure Suit Larry on his beaver float from LSL6! Starmie! Water is my jam, bruh. You mention Sailor Neptune but not Sailor Mercury? For shame. Also, TMNT NES Area 2 and Morpha from Ocarina of Time. 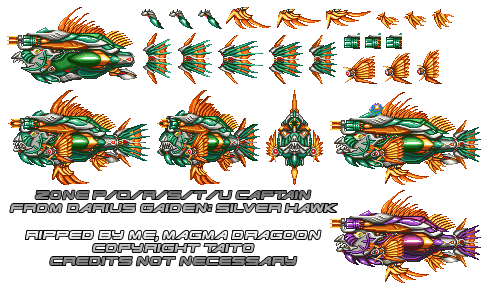 The swordfish from Donkey Kong Country water level. And, scuba gear from Goonies II on NES. Gotta have Godzilla in the distance for sure. The mermaids from Goonies, Peter Pan, and Chicken of the Sea. pukupuku and gesso from mario. er, cheepcheeps and bloopers. that face-melting goop from Creepshow 2's "The Raft"
The dragonzord from mmpr...it starts out underwater. 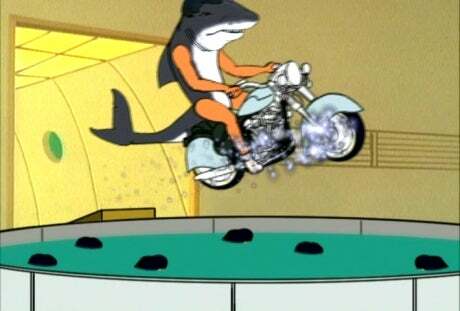 The Sharkticons and giant robot squid from Transformers: The Movie are most definitely prerequisites. You might also consider including Piranacon, the deliciously pink and teal Decepticon combiner made up of horrific sea creatures! There's also an incredible shark Transformer named Sky-Byte from the 2001 "Robots in Disguise" series that would also fit right in. Also: I imagine Godzilla and other kaiju are shoe-ins, but don't forget Gamera! 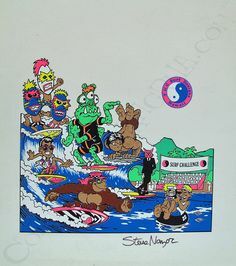 Toxic Crusaders Toxic Surfer with Toxie riding on it. The mermaid from The Goonies II on Nintendo. Her name was Anne? Madballs. Specifically the one that looks like a pirate! The original Final Fantasy game on NES had some fun aquatic monsters that might look good on this poster. Maybe the "Eye eye"? Ultros from Final Fantasy 6. How about dive-dive from gobots and the surf nazis from surf nazi must die. Could also have bob the killer goldfish and number 4 from earth worm jim floating in inter-tubes on the surface. Also could have salmon mack from sam and max. Could also have Jason and the Argonauts sailing by. 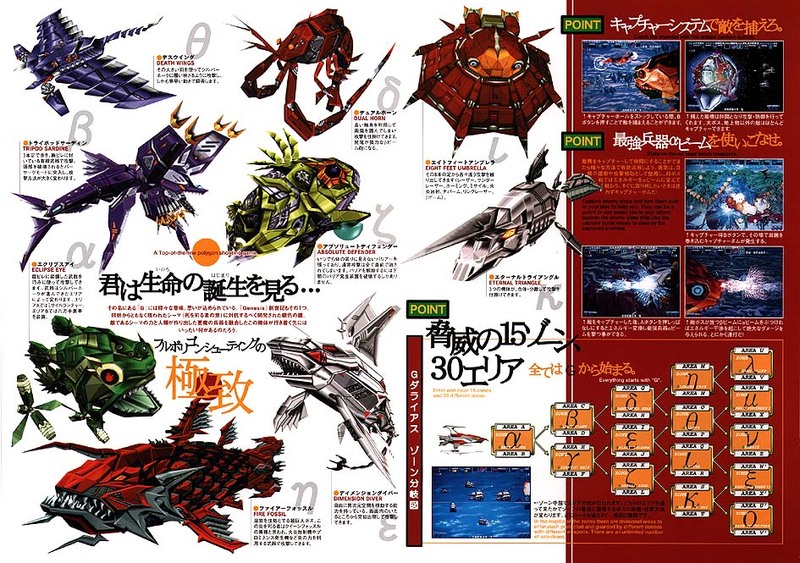 Darius (possible my favorite shmup series) has enemies and bosses that are based on aquatic animals. There are underwater levels so the ship could be used too. 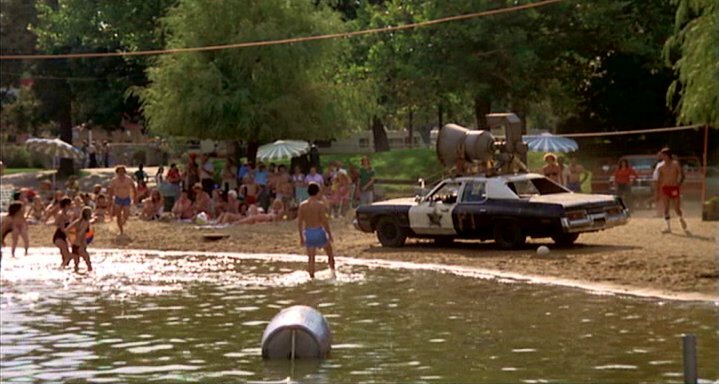 If the poster is going to have a shore line or beach of some sort, I would suggest having the Blues Brothers riding by in their Bluesmobile with the giant megaphone attached on top. Jabberjaw and The Neptunes, can't beat the classics. Another classic that seems to have been missed: the Nautilus with Captain Nemo from "20,000 Leagues Under the Sea"
-Captain Long John Silver from Treasure Island. -ummm...The Love Boat? I guess? The Ninja Turtles trying to pass annoying electric obstacles? Clash of the Titans and CotT's Remake Krakens battling each other. The giant man-eating squid from one of my favorite bad movies "Deep Rising"
Just make a random cruise ship, or even better, one that says "Pacific Princess" from the Love Boat being ensnared by the giant squid. Another idea; have Roy Scheider battling Jabberjaw like in "Jaws" as the teens watch in horror from their sub, as he gets speared? or maybe have Roy Scheider battling the SeaQuest DSV sub? and also add some human made environmental disasters like an oil tanker or something spilling oil everywhere. And of course squirtle from pokemon. 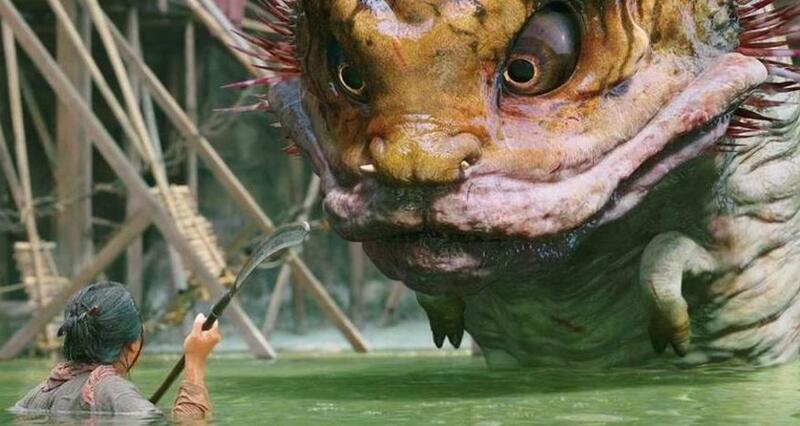 Fish monster from "journey to the west"
How about Chilly Willy the penguin swimming and chasing after a Blooper? How about Jason Mamoa's Aquaman? You could have him fighting the traditional Aquaman. Pardon the spamming, but how about the Iwatobi Swim Club boys? Previous post: In Defense Of Freddy’s Dead: The Final Nightmare. Next post: Ecto Coolest: A Documentary About The World’s Biggest Ecto Cooler Fans.